The new iPhone dock comes from Wilson Electronics that aims to improve the quality of the received audio smartphone from Apple. At the height of CES 2013, which introduced and launched numerous products of different houses in the development, Wilson wanted to launch this accessory that improves up to 10 times the quality of the phone signal allowing also to keep the iPhone resting in any place thanks to its adjustable feet of the dock. The Sleek 4G, this is its name, will be available towards the end of January in the United States and assume that will soon arrive in Europe, or at least will be available for import. 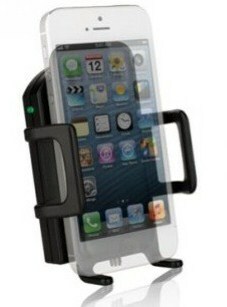 You do not need to do anything with the iPhone because just place it on the stand and you got the service you needed. From this moment the signal of your iPhone will be more powerful than ten times and you can make calls not only lighter, but also connect to the internet in a more rapid and quiet. Wilson explains that it is possible to increase the signal to 2000 mW, much more than 200 mW of up to date mobile phones. The price of this accessory will be $ 199.